It had been thought that Alex would complete his move to Juventus ahead of the transfer deadline tomorrow evening. The centre-back is desperate to leave west London as he is no longer in Andre Villas-Boas' long-term plans and sees a move to Italy as a surefire way to restart his international career. However he might not have to travel so far, as north London rivals Arsenal have emerged as contenders to sign the Brazilian. 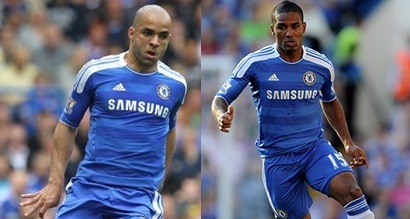 Arsene Wenger has lined up a £7m move for Alex with an additional £8m swoop for French midfielder Florent Malouda. Wenger is desperate to strengthen his squad after Sunday's humiliating 8-2 defeat at Manchester United. He is also keen on his midfield team-mate Yossi Benayoun. Malouda, 31, also has years of experience in the top flight. Chelsea want £10m for Alex, 29, but the Arsenal board believe they can land their man for less. Alex has played 111 games for the Blues following his signing in 2007 after a loan spell in Holland with PSV.